A larger tablet from Samsung with a 9.7-inch screen and running on the Android 7 operating system at time of test. The Google Play Store is included for downloading additional apps. Tested with 32GB of storage. 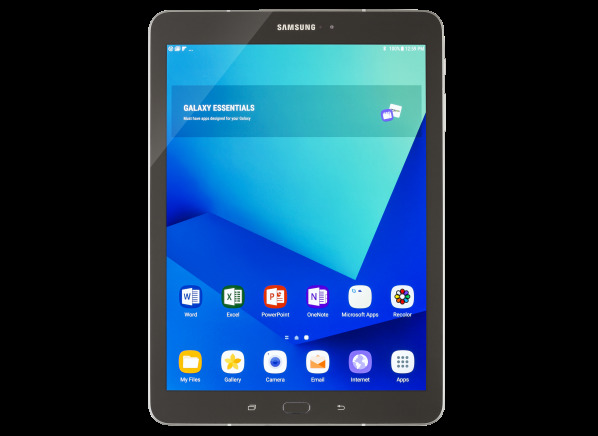 The Samsung Galaxy Tab S3 SM-T820 (32GB) is a larger tablet with a 9.7-inch screen. It has a display resolution of 2048 x 1536, and produces typical detail at 264 pixels per inch. The squarish screen is a better shape for photos than for videos. The tablet has a 1.6GHz Qualcomm processor and ran on the Android 7 operating system at time of testing. It has 4GB memory and is available with 32GB storage. You can add a micro-SD memory card for more storage. You can connect to the internet using 802.11ac WiFi. It has Bluetooth and you can mount a flash drive using the USB type-C port. It has a 5-megapixel webcam and a 12.8-megapixel camera. It includes a stylus. The Samsung Galaxy Tab S3 SM-T820 (32GB) measures 9.3 inches long by 6.6 inches wide by 0.2 inches thick. Without a keyboard, it weighs 0.9 lbs.